Having struck a highly controversial agreement with Greece’s European creditors, former prime minister Alexis Tsipras is now confronted in real time with a fundamentally changing political landscape. New parties are emerging on the left of the political spectrum. His own Syriza party has yet to find its footing after the split of the Left Platform and the establishment of Popular Unity ahead of early general elections on 20 September. What would usually take months, if not years, in other countries is happening with lightening speed in Greece. For the first time since the initial 2010 memorandum, all the mainstream political parties in Greece have – more or less reluctantly – had to acknowledge the need to accept stringent reform requirements (“prior actions”) in exchange for multi-year financial assistance. Syriza is now part of this political mainstream in Greece. Only the extreme fringe parties on the left and right of the political spectrum are distancing themselves from memorandum policies and calling, with varying decibel levels, for a return to the drachma. This re-arrangement of political chairs gives Greek voters a clear-cut binary option to make an informed choice between the merits and fallacies of the memorandum and the anti-memorandum camps. But it does not make it any easier for them in identifying a preference from among the former group of parties. Promises and slogans were key instruments in getting the vote out in the January elections and July referendum. 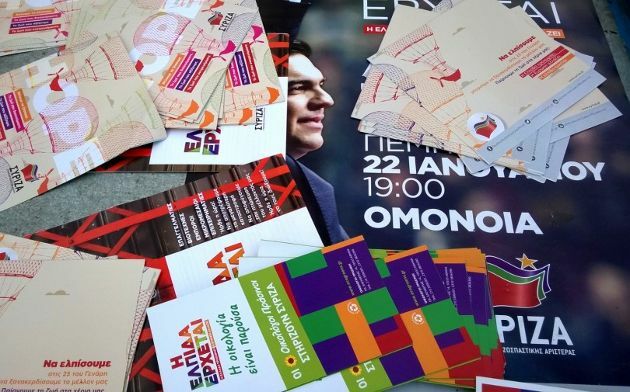 But the same campaign strategy will not work again, given how discredited many of its advocates are and how disillusioned voters have become in the course of the past seven months with Syriza and with other established parties in recent years. Thus two alternatives present themselves to mobilize the Greek electorate. One is being paraded by Syriza operatives as a default option, namely the popularity of the former prime minister. Tsipras indeed enjoys remarkably and consistently high approval ratings. He is preparing an electoral strategy that is essentially focused on his persona, arguing his own version of “TINA” politics: There Is No Alternative …to me. However, two caveats should be borne in mind. These forthcoming elections are not a presidential contest. They are the third national ballot in 2015. The former prime minister’s political popularity will be challenged by voter fatigue and disillusionment. Furthermore, high approval ratings and the capacity to draw large crowds do not necessarily translate into votes at polling stations on election day. Most opinion polls can be ignored in the coming weeks. As we have learned in Greece and other European countries, it is increasingly difficult to trust such electoral projections, and many polling companies have repeatedly had egg on their faces in the course of recent years. Looking at betting agencies and the odds they offer for a victory of any party in Greece on 20 September may be a more reliable way of political forecasting. As many other popular politicians across Europe have had to painfully and unexpectedly experience, most recently in the case of the Labour Party in the United Kingdom, name and face recognition are important in their own right. But angry, confused or burdened voters who still bother to cast a ballot demand more specifics and credibility from their (future) political leaders. Providing these is the other alternative facing parties in mobilising voters. This conundrum applies as much to Syriza as to other larger or smaller memorandum parties in Greece. But within this puzzle may also lie an opportunity that will challenge those candidates vying for citizens’ attention and their subsequent vote. Despite the controversies surrounding the rational for and procedures of holding this snap election, they may also offer something that the Greek electorate has not given up hope on entirely. This concerns soft power elements such as programmatic clarity, capacity to cooperate by reaching across the aisle and genuine leadership capacity. On this count, the coming weeks will present voters with an intense and short electoral campaign. They know all the protagonists involved. They have voted for or against them in changing combinations during the past five years. The re-arranged political landscape in Greece is as much in flux as voters’ electoral preferences. While the menu of options allows for many choices, the forthcoming ballot essentially boils down to making a decision – however uncomfortable it may be – about which side of the political fence one prefers to sit in the coming years. The implementation of the third memorandum is a sine qua non for any future government in Athens. The European creditors have structured the programme in such a manner that review missions will coincide with the timetable of Greece’s international payment obligations. Hence, defining leverage will be limited for the next prime minister. Moreover, cooperation with the quartet of creditors on prior and pending actions will require a level of micro-management that tests programme ownership in Athens. Under these constraining circumstances the field of pro-memorandum parties has a political responsibility towards voters to speak the truth about the hardships in stock and the challenging road ahead. Instead of being offered illusions yet again, promises and false hopes, voters will want a realistic assessment of what needs to be done and convincing answers on who the domestic and international stakeholders are and how long it may still take. Honesty towards the electorate instead of mistaken beliefs could work wonders here. Finally, lest not forget the European dimension of these elections in Greece. Rebuilding trust with the European Commission in Brussels, the European Central Bank in Frankfurt and with numerous finance ministers in the Eurogroup is a work in progress after all that happened in the course of the past seven months on both sides of the divide. This is the most challenging prior action that Greece faces vis-à-vis Europe. But European institutional and national government representatives would also be well advised to apply the lesson learned from the two previous elections in 2015. The need to exhibit restraint with microphones and refrain from unsolicited advice or even threats as to how Greeks should vote on 20 September. They would be wise to think again before making interventions from abroad. Jens, I think your framing of the issue is not correct. That Schauble wanted and still wants all Greek political parties implicated in the MOU business is without a doubt. But Tsipras and his party are not implicated yet. That's why they would be exiting at the bus stop called September 20 parliamentary elections. To continue to fight against the so called "agreement with a gun over your temple" which pseudo-agreement they have already rejected. Forget about Tsipras collaborating. The main question goes back to Schauble and sounds something like this: If Schauble wants to rule occupied Greece then it's Schauble's responsibility to find the 3-4 suicidal Greek political parties to do his bidding. Syriza and Tsipras are totally out of it.Schauble can not depended on Tsipras to capitulate. Tsipras got a lesson and he now knows that his future is in the mountains with the rest of the Greek resistance. BTW, I am not defending neither Tsipras nor Syriza because they don't represent my political vies. Iam only observing here.